This book charts the paths, rivers, villages and landmarks along a 100 mile route that follows in the footsteps of Lady Anne Clifford. The walk begins in Skipton where she was born in 1590 and finishes near Brougham Castle where she passed away 86 years later. Between these points it weaves around Barden Tower, Pendragon Castle, Brough Castle and Appleby castle, all restored by Lady Anne when she finally succeeded in reclaiming the lands that were passed to her uncle on the event of her father's death. A must for lovers of long distance walks and history buffs alike, this is a uniquely interesting hike through the history and heritage of Yorkshire and Cumbria. Lady Anne's Way is a long-distance Pennine walk from Skipton to Penrith devised by Sheila Gordon. The walk takes its name from Lady Anne Clifford who inherited the vast North of England estates of the Clifford family, and set about restoring the castles and major buildings in the latter part of the 1600s. The walk starts from close to Skipton Castle where Lady Anne was born in 1590 and follows "in spirit" some of the routes taken by Lady Anne as she visited Barden Tower, Pendragon Castle, Brough Castle, Appleby Castle, Brougham Hall and Brougham Castle, all of which she repaired and restored, as well as several local churches. The attractive route, waymarked throughout, goes via Wharfedale, Wensleydale and the Eden valley. It crosses from Wharfedale to Wensleydale on the track over Stake Moss, and from Wensleydale to the Eden Valley it follows the ancient route now known as The High Way. The walk can be divided into six stages or nine stages. Sheila Gordon's convenient pocket-size guide is a nicely produced book with clear and detailed maps, and it is beautifully illustrated, in parrticular with numerous drawings by Frank Gordon. Sheila's text not only includes clear instructions to compliment the maps, it reveals a writer who loves the Pennine countryside through which the walk passes and knows a lot about it too. En route, we also learn much about Lady Anne Clifford, her life and times. I've always considered that walking is not just something to be done for health, beneficial as this is, but a recreation that gives an enhanced appreciation of the places where we walk, the landscapes, the buildings and the history. What better way of doing this than walking Lady Anne's Way with Sheila Gordon's enjoyable guide! See the West Ridng Ramblers here. Tracing Lady Anne Clifford's association with the Yorkshire Dales and Cumbria, from Skipton to Penrith, Sheila's walking guide is now in its third edition. Noting all appropriate ladder stiles, kissing gates and boundary fences to keep you on the waymarked path, and accompanied by clear strip maps, the book is a must for practical walking use. From the discovery of the Ormside Cup to Lady Anne's travels with menservants on horseback, historical knowledge is peppered throughout and combined with characterful illustrations of contemporary scenes from Frank Gordon. PASSIONATE long-distance walker Sheila Gordon is celebrating the culmination of an ambition which has driven her for more than 20 years. It is the publication of the waymarked edition of Lady Anne's Way, 100 miles from Skipton to Penrith. Clive White reports. Anne Clifford spent more than half a life-time hanging on to her heritage despite pressure to let go from some of the highest folk in Jacobian England, including King James 1. So when she eventually was granted legal possession of her lands in Craven and Westmorland she was determined never to let go. Hence, she regularly traipsed up-and-down her north country, mostly carried in a horse-litter, and aged in her 50s, keeping a beady eye on her hard won territory. Jessica Malay's just published book "Anne Clifford's Autobiographical Writing" helps illustrate how well researched is Sheila's book. Anne kept a "diary" for much of her life and she records on January 10 1667 how she and her cohort shifted from Skipton castle through Haw Park, near Embsay, passing Halton and on to Barden Tower, one of her favourite retreats. Some time later she sets out again, bound for Pendragon castle, stopping off on the way at her friend John Symondson's house in Starbotton. To quote Anne from her writings: "And from thence the next day I went up Buckden Raikes and over the Stake and so out of Craven and over into Mr John Coleby's House in Wensleydale where I lay that one night." Essentially Sheila has followed in the spirit of Anne's journey, "striking a balance between sticking religiously to the routes while gaining a true flavour of the surrounding landscape." What she has produced, with help from umpteen other sources, is an impressive colour illustrated book which will fascinate both walkers and people just interested in Anne Clifford who was born in Skipton castle in 1590 and died in Brougham Castle near Appleby in 1676. It is packed within formation about how to tackle the routes, there are strip maps, information about the various communities and a biography of the resolute Anne to keep walkers motivated on the way. 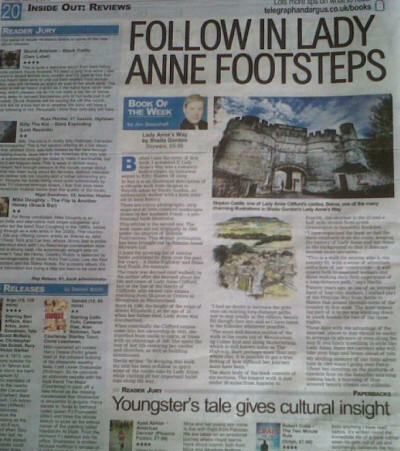 "In 1993 I’d attended a lecture about the River Ure and its source and heard mention of the Lady Anne and of her vast estates in both Yorkshire and Westmorland and how she travelled extensively throughout the north of England, supervising the restoration of her ruined castles in the mid 17th century. "It seemed a natural progression to link all these castles together to form the backbone of a long distance route which would be full of historical interest as well as passing through some stunning scenery. "The first edition of Lady Anne’s Way came out in 1995 - Hillside Publications - with a revised edition in 2003. A new edition was published by Skyware in 2013 in full colour and with strip maps. "As the route became more popular it was decided to apply for the route to be waymarked and a development plan was submitted to the relevant authorities in 2015. "This was eventually agreed and a group called ‘The Friends of Lady Anne’s Way’ was set up to help facilitate the project and to raise funding. "A total in excess of £1,500 was eventually raised, the main sponsors being Ramblers Holidays Charitable Trust, the Long Distance Walkers Association and a grant from Cumbria County Council community grant scheme. "Without these initial donations we wouldn’t have been able to proceed. "Following on from this, funding was received from Grassington and Kirkby Stephen town councils, Mickledore Walking Holidays, based in Keswick, Craven U3A walking group and two private individuals." Sheila and friends, supporters and sponsors of the project recently launched the book beneath the drum towers of Skipton castle followed by a five mile walk along part of the route - complete with new waymarks - before looping back to Skipton via the Leeds/Liverpool canal. "What better way to celebrate the completion of the project and also to remind us of the amazing achievements of such in incredible woman, who fought against all odds to reclaim her natural inheritance. "As a tribute to her a lifesize bronze "In the Spirit of Lady Anne" is being created by renown sculptor Diane Lawrenson. to Lady Anne but also be an incentive and inspiration to all those who follow in her footsteps," Sheila added. Joining the walkers was Joe Colls, a volunteer for the Ramblers Holidays Charitable Trust, which helped with funding. He said: "Sheila has worked for over 20 years to establish Lady Anne’s Way as a recognised walking route. She applied to RHCT for a small grant and we were able to help her achieve the waymarking that is necessary to make such a route user-friendly." The organisation's remit was to improve access to, and the condition of, the British countryside and footpath network by awarding grants. Lady Anne’s Way was a good example of the benefit that a small RHCT grant could make to a larger project. Lady Anne's Way is for sale at £9.99 (P&P free) and details are on the Lady Anne's Way website. Copies are also available from the publisher, Skyware, and from Skipton Castle and other outlets. See the Craven Herald here. Published this year “Lady Anne’s Way” by Sheila Gordon is a detailed guide to a long distance walk from Skipton to Penrith. The walk takes its name from Lady Anne Clifford who was born in Skipton Castle in 1590, the daughter of George Clifford, 3rd Earl of Cumberland. Although by the time of the earl’s death she was the only surviving child, the estate initially went to her uncle and his male heirs, but she was later able to regain it. As well as Skipton Castle, Lady Anne’s estate included Barden Tower, Pendragon Castle, Brough Castle, Appleby Castle, and Brougham Castle. The 100 mile walk takes in all these fine buildings in Lady Anne’s former estate. The route of the walk includes much enjoyable dales walking in Wharfedale, Wensleydale and the Eden Valley. There are also some fine high-level sections as the walker climbs up to Capplestone Gate, crosses Stake Moss between Wharfedale and Wensleydale, and, highlight of the walk, follows the whole length of “The Highway”, the magnificent ancient road between Wensleydale and the Eden Valley, a route not infrequently used by Lady Anne. Sheila Gordon has a lively, interesting style of writing that makes the book a pleasure to read in its own right, and she often tells us more about the history of the places and buildings visited en route. The maps are detailed and clear, and there is a wealth of illustrations, including many enjoyable drawings by Frank Gordon. 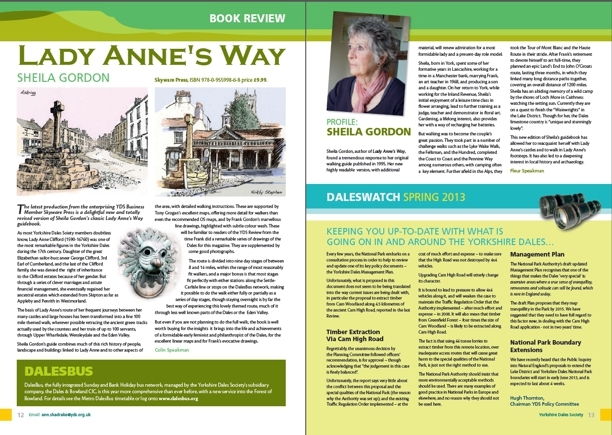 “Lady Anne’s Way” is published by Skyware, and is available (cost £9.99) at www.skyware.co.uk and local bookshops. See the West Riding Ramblers website here. The latest production from the enterprising YDS Business Member Skyware Press is a delightful new and totally revised version of Sheila Gordon's classic Lady Anne's Way guidebook. As most Yorkshire Dales Society members doubtless know, Lady Anne Clifford (1590-16760) was one of the most remarkable figures in the Yorkshire Dales during the 17th century. Daughter of the great Elizabethan sailor-buccaneer George Clifford, 3rd Earl of Cumberland, and the last of the Clifford family, she was denied the right of inheritance to the Clifford estates because of her gender. But through a series of clever marriages and astute financial management, she eventually regained her ancestral estates which extended from Skipton as far as Appleby and Penrith in Westmorland. The basis of Lady Anne's route of her frequent journeys between her many castles and large houses has been transformed into a fine 100 mile themed walk, wherever possible retracing the ancient green tracks actually used by the countess and her train of up to 100 servants, through Upper Wharfedale, Wensleydale and the Eden Valley. Sheila Gordon's guide combines much of this rich history of people, landscape and buildings linked to Lady Anne and to other aspects of the area, with detailed walking instructions. These are supported by Tony Grogan's excellent maps, offering more detail for walkers than even the recommended OS maps, and by Frank Gordon's marvellous line drawings, highlighted with subtle colour wash. These will be familiar to readers of the YDS Review from the time Frank did a remarkable series of drawings of the Dales for this magazine. They are supplemented by some good photographs. The route is divided into nine day stages of between 8 and 14 miles, within the range of most reasonably fit walkers, and a major bonus is that most stages fit perfectly with either stations along the Settle- Carlisle line or stops on the DalesBus network, making it possible to do the walk either fully or partially as a series of day stages, though staying overnight is by far the best way of experiencing this lovely themed route, much of it through less well known parts of the Dales or the Eden Valley. But even if you are not planning to do the full walk, the book is well worth buying for the insights it brings into the life and achievements of a formidable early feminist and philanthropist of the Dales, for the excellent linear maps and for Frank's evocative drawings. Sheila Gordon, author of Lady Anne’s Way, found a tremendous response to her original walking guide published in 1995. Her new highly readable version, with additional material, will renew admiration for a most formidable lady and a present-day role model. Sheila, born in York, spent some of her formative years in Lancashire, working for a time in a Manchester bank, marrying Frank, an art teacher in 1968, and producing a son and a daughter. On her return to York, while working for the Inland Revenue, Sheila's initial enjoyment of a leisure time class in flower arranging, lead to further training as a judge, teacher and demonstrator in floral art. Gardening, a lifelong interest, also provides her with a way of recharging her batteries. But walking was to become the couple's great passion. They took part in a number of challenge walks such as the Lyke Wake Walk, the Fellsman, and the Hundred, completed the Coast to Coast and the Pennine Way among numerous others, with camping often a key element. Further afield in the Alps, they took the Tour of Mont Blanc and the Haute Route in their stride. After Frank's retirement to devote himself to art full-time, they planned an epic Land's End to John O'Groats route, lasting three months, in which they linked many long distance paths together, covering an overall distance of 1200 miles. Sheila has an abiding memory of a wild camp by the shores of Loch More in Caithness watching the setting sun. Currently they are on a quest to finish the “Wainwrights” in the Lake District. Though for her, the Dales limestone country is “unique and stunningly lovely”. This new edition of Sheila's guidebook has allowed her to reacquaint herself with Lady Anne's castles and to walk in Lady Anne's footsteps. It has also led to a deepening interest in local history and archaeology. See the Yorkshire Dales Society website here. LADY ANNE’S WAY BY SHEILA GORDON. £9.99. Lady Anne's Way is a long distance trail of 100 miles following in the footsteps of the remarkable Lady Anne Clifford. It begins in Skipton where she was born in 1590, and finishes in Penrith, where she died some 86 years later. The walk is one of great beauty and historical interest; it passes through the wonders of the Yorkshire Dales with its unspoilt villages and its limestone pavements and progresses into Cumbria’s Eden Valley. It is filled with fascinating historical background, brought together with forty drawings from Frank Gordon. Paperback, 96 pages. Colour illustrations and maps. Before I saw the cover of this book, I wondered if Lady Anne’s Way was a romantic bodice-ripper, an historical sequel to Fifty Shades Of Grey. In fact it is an illustrated description of a 100-mile walk from Skipton to Penrith taken by Sheila Gordon, an enthusiastic walker with a keen interest in local history. There are colour photographs, strip maps and 40 little coloured landscapes drawn by her husband Frank – a professional book illustrator. This edition is the second one. The book came out originally in 1995 under the imprint of Hillside Publications. This 96-page publication has been brought out by Saltaire-based Skyware Ltd. It joins the growing list of similar books published by them over the last few years – A Dales High Way and Dales Rail Trails, for example. The route was devised (and walked) by the author after she learned about the life and times of Lady Anne Clifford, last in the line of the family of Cliffords, who owned vast estates reaching from Skipton in Craven to Brougham in Westmorland. Born in 1590, the height of the reign of Queen Elizabeth I, at the age of 15 when her father died, Lady Anne was disinherited. When eventually the Clifford estates came into her ownership in 1643, she travelled from castle to castle, at times with an entourage of 300. She spent the rest of her life restoring her castles and churches, as well as building almshouses. Sheila writes: “In devising this walk my aim has been to follow in spirit some of the routes taken by Lady Anne, while visiting all her important buildings along the way. The main body of the book consists of six sections. The longest walk is just under 20 miles from Appleby to Penrith, the shortest is the 12-and-a-half mile stretch from green Grassington to beautiful Buckden. “This is a walk for anyone who is reasonably fit, with a sense of adventure and a love of our countryside – it will appeal both to seasoned walkers and those seeking their first experience of a long-distance path,” says Sheila. Twenty years ago, as one of an intrepid band of four city slickers, I walked part of the Pennine Way from Settle to Hawes that passed through some of the country in this walk. The least appealing part of it to me was bunking down in youth hostels for two of the three nights. These days with the advantage of the internet, places to stay should be easier to arrange in advance or even along the way. If you fancy travelling in style like Lady Anne, there are carriers who will take your bags and boxes ahead of you. My abiding memory of our little adventure in 1993 wasn’t going over Pen-y-ghent but standing on the platform of Gordale Scar on the Saturday morning coming back, a morning of blue scoured beauty, silence and stillness. See the Telegraph & Argus website here. If you like your long-distance walks to have a theme, this could be the perfect book as Sheila Gordon, an avid walker and local history fan, divides the 100-mile route into six stages, linking an amazing array of castles owned and restored by the formidable Lady Anne Clifford. It kicks of at Skipton castle, where Lady Anne was born in 1590, and takes in Barden Tower, Pendragon Castle, Brough Castle and Appleby Castle before arriving at Brougham Castle at Penrith, where she died 86 years later. The book is well served with maps and a wealth of historic information - as well as 40 illustrations from the artist Frank Gordon. See the Westmorland Gazette here. The story of Lady Anne Clifford is fascinating and there is nothing in the least contrived about Lady Anne’s Way, which follows the route of her endless journeying between her five castles from her seat at Skipton via Barden Tower, Nappa Hall (Askrigg), Pendragon Castle (south of Kirkby Stephen), Brough Castle and Brougham Castle (Penrith). She lost what she thought was her inheritance on her father’s death in 1605 and fought for nearly 40 years to regain it. When she did she spent the rest of her long life working hard to set her estates and properties in order. So, a gentle but fascinating walk, with many historical and architectural diversions. It would be a shame to rush this in five days. The guide contains lots of fascinating detail on each of the six sections: Skipton – Grassington – Buckden – Hawes – Kirkby Stephen – Appleby – Penrith, with great detailed strip maps and lovely illustrations in the Dalesman style.